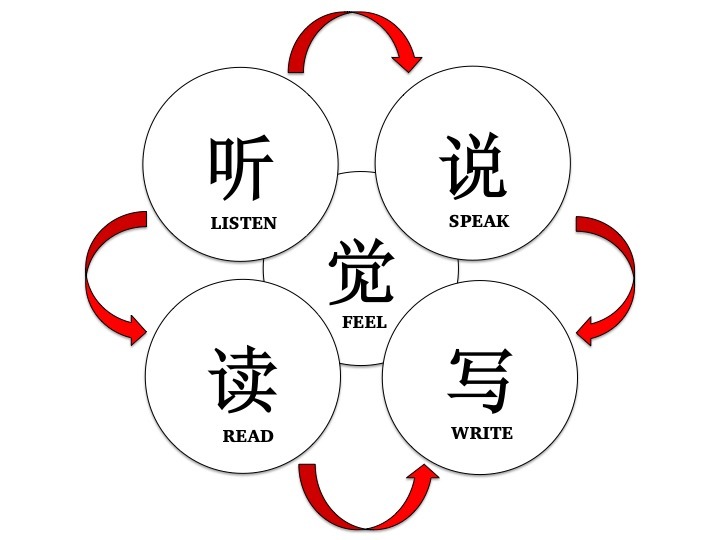 You have probably heard time and time again that the proper course to take to language learning is through these four keys: Listen, speak, read and write. Well, I am adding in yet another element which I feel is the most important of all: feel. These elements work in tandem with one another to make language learning a holistic task. 听 (tīng) means to listen. Be it listening to pop songs on the radio or news on television, it is important that your ears are pricked to hear the words, dialogues and even lyrics on various media platforms. Communication is a two-way channel. It is never about just speaking your mind. If thinking before you leap is important, listening before you speak is even more essential. 说 (shuō) means to speak. As with every language, knowing how to speak fluently is pivotal to really mastering the language and being a great orator eventually. Always associate yourself with people who speak fluent Mandarin. They will be your mirror to speaking the language well. And if all else fails, turn to a mirror. 读 (dú) means to read. It is an irrefutable notion that reading opens new doors of perspectives and exposes you to the outside world. You should aim to read a wide variety of resources, from newspapers and novels to magazines, or even useful online materials. Always make it a good practice to check the dictionary whenever you come across a difficult word. A bilingual (English-Chinese) dictionary will be useful in your reading pursuits. 写 (xiě) means to write. Learning how to write is testimony that you are able to grasp the language in totality! However, it is imperative to note that every stroke of the Chinese character is written in a sequence that needs to be adhered. You should always learn to practice writing new words not once or twice, but until it gets imprinted in your memory. Last but not least, you need to HAVE the ability to “feel” (觉 jué). What I mean by that is to free your mind to new perspectives. The more “open” are your doors to inspiration, the more effective is your learning process. Be sure to encompass 觉察(jué chá) and 观察 (guan chá), which means to observe our environment and the things around us. Day in day out, our environment is evolving. News is only new when they are current. Hence, we should always learn to observe and keep up with the latest trends. Sitting in an MRT or people-watching in a café can sometimes produce unexpected results needed for our language learning.